A steeelcage match with no holds barred. Which Crossover, 3-row hybrid would you choose? 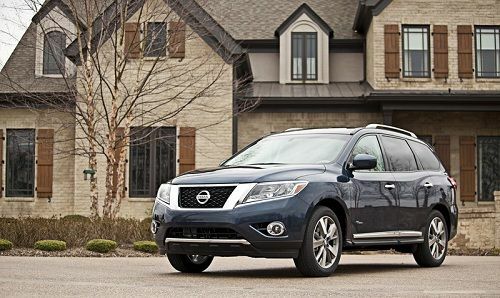 The 2014 Nissan Pathfinder Hybrid is ready for a good throw-down against the fuel economy champion of the mid-size SUVs, the Toyota Highlander Hybrid. Nissan and Toyota have been mixing it up in matchups across the range of vehicles they offer and the fun extends to the Infiniti and Lexus brands by proxy as well. Toyota invented the mid-size crossover market and its sales are solid. In 2005 the Highlander Hybrid (model year 2006) was introduced on the previous, shorter platform coupled to the 3.3 liter V6 engine. When Toyota launches the 2014 Highlander Hybrid later this year it will be in its 8th production year. Meanwhile, the Nissan Pathfinder used to be a body-on truck frame sport ute. It was heavy, it used yester-tech, and customers were in love with it – until they weren’t anymore. Terrible fuel economy, compared to the Highlander and other cars in the class that Nissan was trying to compete in, were killing the Pathfinder’s sales. Then, this current year, Nissan changed it up. They created a new crossover vehicle, with three rows and V6 power, but with good fuel economy and kept the name Pathfinder. Sales have doubled. In this matchup we are going to meld the 2013 Highlander Hybrid with the coming very similar 2014 Highlander Hybrid, and compare it to the current, just revealed, 2014 Nissan Pathfinder Hybrid. We know that Toyota is going to offer a very similar drivetrain to the 2013, but with the new body changes the 2014 has ushered in, so our analysis will be pretty accurate. Either TN or some other publication will test the cars later back to back “all serious like,” but we are going to have a little fun while presenting you, the reader, with some facts and figures in a way that won’t bore you to tears. As a theme, we have selected a Mad Max, Beyond Thunderdome type scenario. A steel cage death match of sorts between these two family-thrusters. Two crossovers enter – one crossover leave. The Highlander Hybrid has a 280 total horsepower engine. Its motivator consists of a 3.5 liter V6 with a constantly variable transmission (CVT) and Toyota’s electric drive. The hybrid tricks we have come to know and sort of love are applied here. After all, Toyota invented all those tricks. We could dive deep here and talk technical, but the upshot is that this crossover gets 28mpg. That number is the EPA estimated city, the EPA estimated highway, and guess what, also the mileage our tester achieved. 28 MPG in a vehicle this size, weight and passenger capacity is nothing short of a miracle. The 2014 Pathfinder’s new drivetrain has not yet been fully revealed by Nissan. Nissan will tell us that the engine is a 2.5 liter four cylinder (they keep that pretty close to the vest by the way) instead of the 3.5 V6 the Pathfinder usually has. That is augmented by an electric drive and the transmission is Nissan’s CVT. The power is 250 hp instead of the conventional drive’s 260, but the hybrid has three more foot pounds of torque – don’t use them all at once! Here’s the bad news, if you can call it that. Maybe to stir controversy, the new Pathfinder’s four-banger is supercharged. Yup. A mechanical device that runs continuously off engine power to compress inlet air has been added. This seems very odd, but ever since VW launched the new turbocharged hybrid Jetta we are no longer surprised by odd couple engines. The vehicle is rated at 26 mpg. That would be 2 less than the Highlander. Normally, we wouldn’t say that is significant, but hybrid shoppers are brutal when it comes to MPG. Advantage Highlander. If you think the hybrid drives in the Pathfinder and the Highlander will leave you wanting more power you are mistaken. Both offer comparable power to the V6 powered conventional drivetrains in these vehicles. In fact, the Highlander has 280 hp, more than the standard V6. The Highlander Hybrid was one of the first V6 hybrids on the market in the US. Not THE first. That would be the Honda Accord circa 2003. Aside from these two V6 hybrids, there were no mainstream cars with both power and a hybrid drivetrain for a long time. Even now they are usually only in luxury cars like the Lexus GS. Most manufacturers and customers seem happy to apply hybrid technology to car that doesn't need it – 4 cylinder fuel sippers. The Highlander Hybrid was, and is, a very driveable crossover. It does not have a lack of power and the hybrid drive isn’t in the way. Our own editor, Patrick Rall has just finished a test of the Highlander Hybrid and his report was a bit surprising. Mr. Rall is a gentleman that likes his sport utes with big V8s and power to spare. His report was a surprise because he had not one bad thing to say about the power or the ride of the Highlander. In fact, he was lucky enough to be hit with a blizzard while testing and even in those poor conditions achieved 25mpg. In the dry he got the EPA estimated 28. I have also tested this drivetrain in the Lexus RX and found that it offered good power and great fuel economy. Nissan has not made a tester available to the TN team yet, but we may have a chance to drive it in the next month or two. If we do we will update the comparison. We expect nothing short of near perfect. In a nod to our confidence in Nissan we will call the handling and drivability part of this fight a tie. Hybrid crossovers like the Highlander and Pathfinder can tow, they are great in the snow as Mr. Rall discovered, they have huge cargo compartments. In fact they are exactly like regular V6, AWD crossovers with three rows. In this matchup however, there is one big difference. The 2014 Highlander Hybrid is an 8 passenger and the Pathfinder is a 7 passenger. We did the math and that means the Highlander can carry one more passenger. That is a big deal. It reminds us of when Mad Max breaks out the dog whistle and start blowing it to incapacitate Master Blaster. Have we lost you yet? This is Toyota saying “Booyaah!” to Nissan’s October 15th press release saying its new 2013 Pathfinder was the most fuel efficient vehicle in its class – even though it is not, the Highlander Hybrid is. Nissan just had a “Someone moved my cheese” moment. Advantages like an added seat and 2 mpg better fuel economy point to an overall win going to Toyota’s Highlander Hybrid. As we said before, we hope to have a chance to drive the new Pathfinder and if we find it comes with some surprises we will update the review.